View of “BLESS N°63 Neutra Dasein,” 2018. Modernist “house museums” across the world—for example, Villa Savoye, the Barcelona Pavilion—are billed as architectural pilgrimage sites. The Neutra VDL House II is no exception. Having served as both lodge and laboratory for the late architect Richard Neutra, the resurrected structure (the first VDL House burned down in 1963) overlooking Silver Lake Reservoir (itself drained and refilled) is a meditation on survival through design. This ethos now encompasses curatorial interventions in the space, with the maverick design duo BLESS—Desiree Heiss and Ines Kaag—moving in and setting up the house to shape “BLESS N°63 Neutra Dasein.” Yet their residence raises preservation questions: Namely, how can one be at home in a storied house ontologically separated from its former function? Being open and atypical helps. BLESS does it all, really—clothing, furniture, accessories. On display is this varied prowess, as evidenced in an arresting and apropos mix of wares. The first floor parlor showcases several fur chair pieces from the collection “BLESS N°60 Lobby Conquerors,” 2017. Dressed in distorted, hairy shawls, these three-legged Artek Lukki stools both tempt and threaten would-be sitters. Neutra's own furniture also met the transformative touch of BLESS: A nearby Neutra Tremaine side chair leans precariously, its stable four legs having been reduced to one marble orb for the work BLESS N°63 Tremaine Challenge, 2018. If the parlor invokes bodily instability, the other nooks find a paradoxical balance between the calm and the constriction of domestic life. Take the two classic fur hammocks, BLESS N°28 Furhammocks, 2018, hung between trees in the garden. Or the duvets in the bijou bedrooms that function as simulacra of the outdoors, with their photographic prints of the view from nearby windows. Yes, some of these trappings may put off architecture aficionados. Yet it’s worth mulling over how each accoutrement furthers Neutra’s vision of how space, even if limited, can foster wellness, potentially curing neuroses. 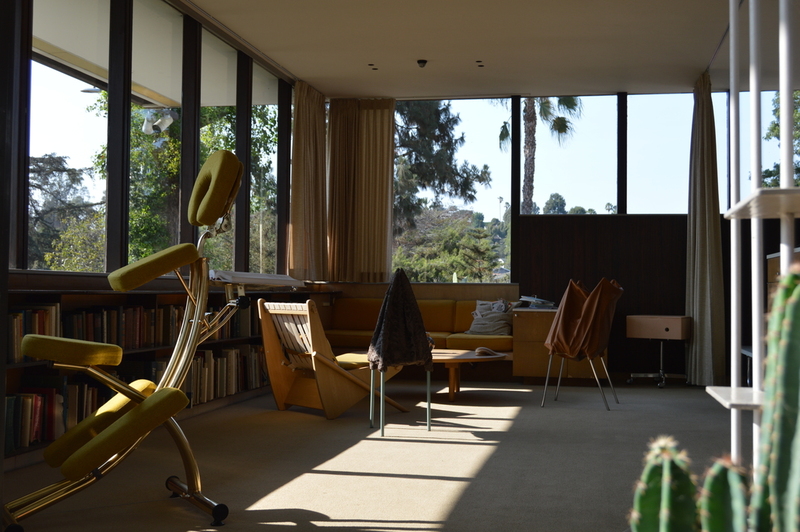 Everything considered, Neutra felt held here, his house never trivialized as mere prop but celebrated as a building block for innovative design.